Former Tennessee running back Alvin Kamara had a record-setting rookie season in the NFL last year. And he’s putting his name in the record books again in his second year in the league. On Sunday, Kamara and the New Orleans Saints took down the Pittsburgh Steelers 31-28 thanks to a Drew Brees passing touchdown to Michael Thomas with 1:25 left in the game. In the process of helping the Saints get to 13-2 on the season, Kamara did something only one other player in NFL history has ever done. During the game, Kamara became just the second player in NFL history to total 1,500 rushing yards and 1,500 receiving yards in his first two seasons in the league. The only other player to do so was Herschel Walker back in 1986 and 1987. After Sunday’s game, Kamara now has 883 rushing yards and 14 touchdowns on 194 carries to go along with 709 receiving yards and four touchdowns on 81 receptions in his second season in the NFL. 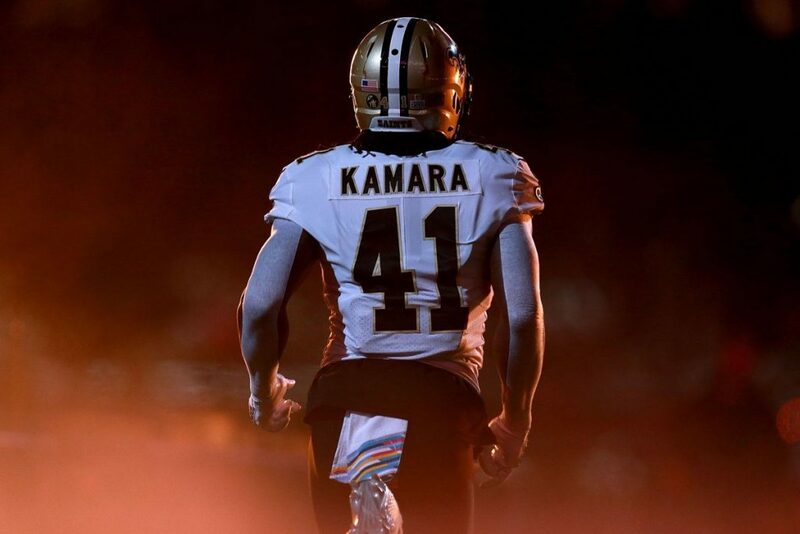 In his 31 career games with the Saints, Kamara has gained 1,611 rushing yards and 1,535 receiving yards. In Walker’s first two season with the Dallas Cowboys in 1986 and 1987, he gained 1,628 rushing yards and 1,552 receiving yards. And Kamara still has one more regular season game left to play in the 2018 season. Walker scored 22 total touchdowns in his first two NFL seasons, and Kamara has amassed 32 total scores so far in his NFL career. He’s scored 22 times on the ground, nine times through the air, and once on a kick-off return. Last season, Kamara became only the second rookie in NFL history to score five rushing touchdowns, five receiving touchdowns, and a kick-off return touchdown in his first season as a professional football player. The only other player to do that in his rookie campaign was Hall of Famer Gale Sayers. When you’re doing things in the NFL that only Gale Sayers and Herschel Walker did, you know you’re having yourself a historic start to your professional career. Kamara was drafted with the 67th overall pick in the third round in the 2017 NFL draft after playing for the Vols for two seasons. With Tennessee, Kamara averaged 6.9 yards per touch on offense in his two seasons with the Vols, though he was only given the ball 284 times on offense in his two years with Tennessee. He scored a total of 24 touchdowns (16 rushing, 7 receiving, 1 punt return) in 24 career games with the Vols. Former Vol running back Alvin Kamara has his named placec in the NFL record books again in only his second season in the league. Kind of makes you wonder "what if" Butch had played him more. Early on, Kamara was an obvious NFL talent. Regardless who his coach was he was going to play on Sunday. For his sake, I think he had enough PT at Tennessee, and he never got injured. Lucky for us he is, and will always be a Vol. Not so lucky for Saban tho, I'll bet he's kicking himself in the gnads for ever letting AK go.